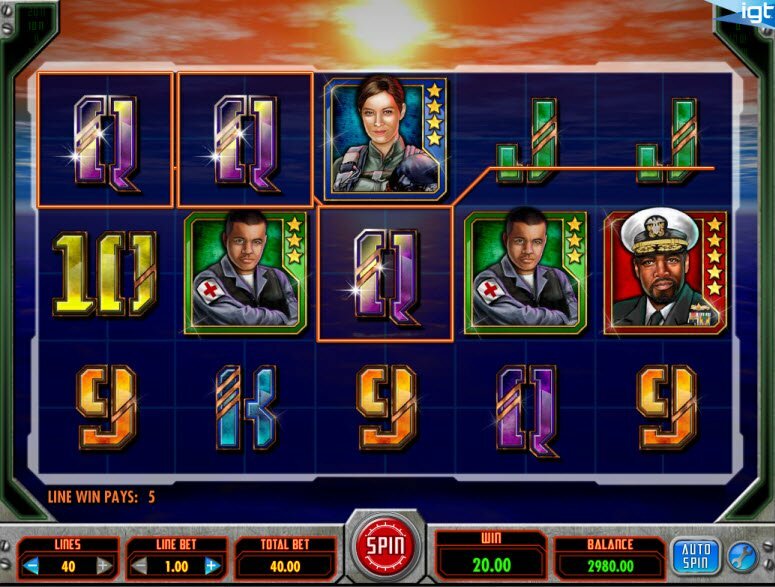 Based on the popular board game, IGT’s Battleship Video Slot puts you on the front lines of a naval battle. 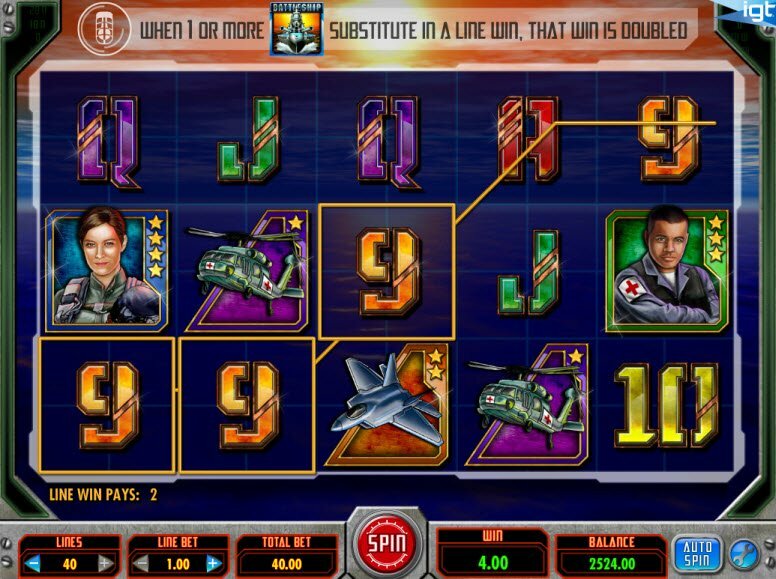 The Battleship Slot Machine contains a whopping 40 paylines making it even easier to win. Although the graphics don’t look very sophisticated, the military theme still makes this game exciting. In addition, the Picker Bonus lets players shoot missiles for special prizes. Whether or not you played the game as a kid or you just love all things Navy, the Battleship Slot really sets itself apart. Its unique nautical theme includes fighter jets, B-52s, helicopters, admirals, pilots, and of course, battleships. Unfortunately, the quality of the graphics falls flat, especially in comparison to some of the more sophisticated 3D Slots available. The Picker Bonus really lets players relive the classic board game. During this bonus round, a missile automatically targets all of the ships. Then, an extra missile targets an additional ship. Each ship awards a certain number of Free Spins, a Free Spins Multiplier, or a Bonus win. 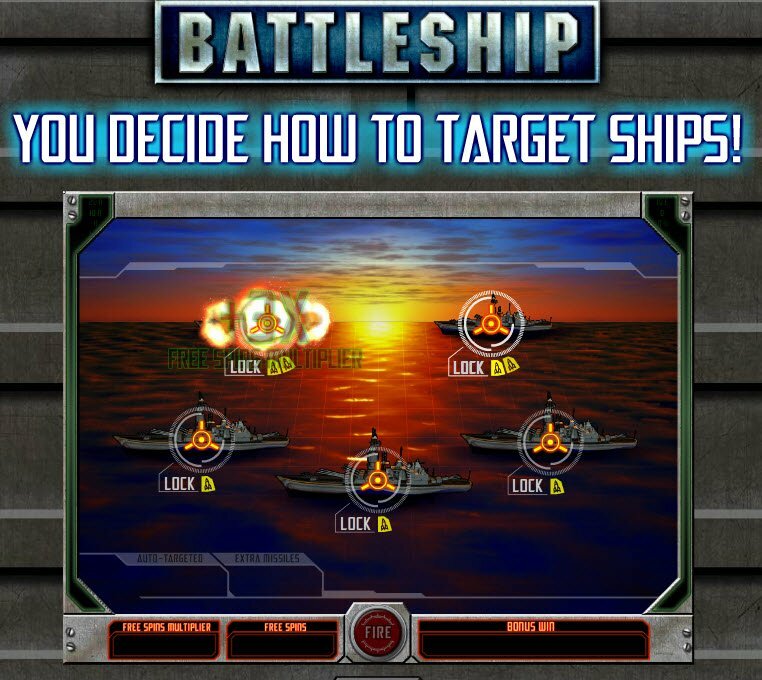 The Battleship Slot Machine has some really cool features that will put you smack dab in the middle of naval battle. The battle begins with the battleship which serves as the Wild symbol. The Battleship Wilds substitutes for all symbols except the Bonus symbol. The Bonus symbol resembles a target. When 3, 4, or 5 Bonus symbols appear in any position on the reels, the Victory Bonus activates with a number of extra missiles in the picker. In addition, when 2 or more Bonus or Scatter symbols appear on the reels, they multiply the bet line by up to X50.